The Rise of the Rent-a-Dress. Does This Spell the Demise of Dry Cleaning? I’ll admit from the outset that I don’t buy expensive clothing. Blame it on my I-could-whip-that-up-in-an-hour-on-my-Janome attitude, growing up in a household where everything was home brand or hand-me-down, or my distinct lack of disposable income (thank you Sydney rental market) I’ve never been one to splurge on designer clothing and accessories. My wedding dress cost $500 and that’s about the most expensive thing I’ve ever owned. So, full disclosure, I don’t buy designer clothes and I can’t put my hand up and say that I make an honest contribution to keeping the Australian fashion industry alive and well, but I do wonder if the rise of the rent-a-dress might spell the extinction of one of the industries that we in garment after care rely on. The GreenEarth office fields interest from prospects of all walks of life; career dry cleaners who have come to believe that the environmentally friendly alternative is the best future their business has, new to the industry cleaners who want to get into the business the best way possible, and recently a young entrepreneur who wanted to add in house cleaning to her rent-a-designer-dress business. It got me thinking. Firstly, what a great little business idea. Secondly, what’s it going to do to the dry cleaning industry? A few years ago, if you wanted to be able to wear a new Bettina Liano to an upcoming event you either had to save and hope to God your size didn’t sell out, or throw caution to the wind and eat 2-minute noodles for a fortnight because you spent your entire groceries budget on that swish little number. It seems that the clothing rental business has diversified beyond tuxedo hires and into the world of designer dresses. In the last five years, dress rental companies have been popping up all over the place and now Australia has more dress rental companies per capita than anywhere else in the world. Instead of spending $500 on a dress you might only wear once (because it’s just too nice to justify wearing anywhere! 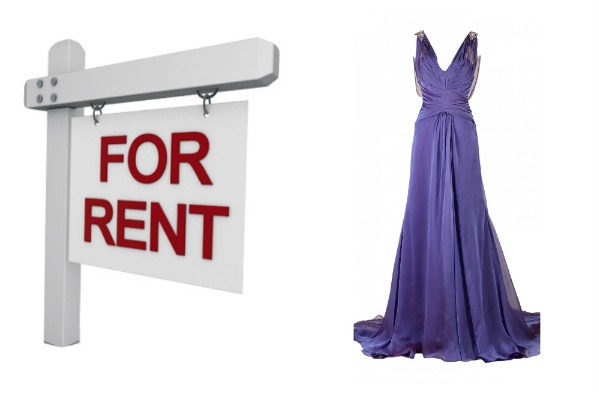 ), you can now rent that same dress for a fraction of the cost – around $90, shipping and dry cleaning included. Instead of ten women buying the same dress, each requiring a clean after each wear, women can now rent the very same for a one off event, and the average dress purchased by one of these rent-a-dress companies has a shelf life of about ten rentals. Hmm. Still, the dress has to be cleaned after each rental, right? But what happens to the single location retail dry cleaner when these cleans are being performed on commercial contract by the larger cleaners who can accommodate (and discount) the volume? Or, when the very entrepreneurial owner of the rental business realizes that she can reduce her cost of sales by incorporating after care into her own business? So what does this mean for the future of fashion? What does this mean for the future of the dry cleaning industry? With the aforementioned Bettina Liano going into voluntary administration after years of fighting the prospect, one might think this is a sign of the times. Thankfully, I had someone with real life experience in the rent-a-dress game in front of me, to whom I could pose the question. Her answer was simple. Her belief is that the rise of the rent-a-dress is in fact, a very positive thing for the fashion industry. In her opinion, if women with little disposable income are able to rent dresses at a fraction of the purchase price, it leaves them with more disposable income to purchase the dresses that they really want. Perhaps only time will tell, but if one thing can be gleaned from these shifting winds it’s that change will affect our industry whether we want it to or not. The challenge for us is to remain at the forefront of innovation.